We accomplish our mission by providing resources such as volunteers, expertise, public outreach, education and advocacy on behalf of the Ironwood Forest National Monument. If you have an idea for a project that could help us fulfill our mission, apply for a small grant funded by the Friends of ironwood Forest! Click here for the application. Our programs focus on accomplishing targeted conservation service projects, educating the public and Monument visitors about the natural and cultural resources, seeking out partnerships with other organizations, and serving as a strong advocate for protecting the Monument. Elimination and enforcement of Recreational Shooting at the Monument. Removal of buffelgrass from priority areas. Meet The Monument, Monument Tours, and other public events that provide on-site interpretation where there is none. Frequent on the ground restoration projects – illegal trash dumping, off-road vehicle use. Promote the protection and sustainable use of Monument resources. Coordinate scientific, cultural and historic research of the Monument and surrounding area. Engagement with the Resource Management Planning Process for the Monument. Develop and distribute education materials and presentations. Advocate for our federal and state public lands. Assist the BLM with implementation of management plans and mandates aimed toward protection of Monument resources. Partner with over two dozen other conservation and government organizations to advance protection of the Sonoran Desert, including an annual National Public Lands Day event. 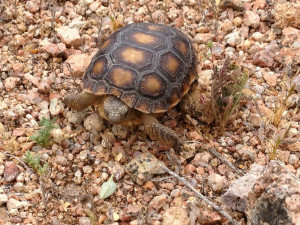 A baby Desert Tortoise at Ironwood Forest National Monument. Some of the best habitat for Desert Tortoises to survive is found within the 129,000 acre Monument. Photo Drew Milsom. Archaeology of the Ironwood Forest National Monument and the surrounding Tucson Basin. An introduction for teachers and parents of young children. Includes games and activities. This guide is a very basic introduction to the study of archaeology for young people, ages 6 to 16. It exposes students to several ways to better understand the things people in the past left behind, and thus the people themselves. A resource management plan (RMP) has been developed for the IFNM for two reasons: to specifically address management of lands within the IFNM in reference to the monument designation, and to implement BLM’s policy to prepare a stand-alone RMP for all National Conservation Lands units, including the IFNM. Presently, the land within the IFNM is managed under the 1989 Phoenix Resource Area RMP (Phoenix RMP) as amended by the Arizona Standards for Rangeland Health and Guidelines for Grazing Administration (USDI, BLM 1997), the Arizona Statewide Land Use Plan Amendment for Fire, Fuels, and Air Quality Management (USDI, BLM 2003a), and the 1987 Eastern Arizona Grazing Environmental Impact Statement (EIS), when decisions in these documents are consistent with the Proclamation. Non-native, invasive buffelgrass greens up and grows quickly during our two rainy seasons – monsoon and winter. It then dries out very quickly, creating a huge fire potential in a landscape that did not evolve with frequent fire. Wildlife habitat plans, such as the Silver Bell Habitat Management Plan, and allotment management plans provide specific management direction and actions for wildlife and range programs on lands within and immediately adjacent to the IFNM. In addition, BLM has been following an interim guidance document for managing public land within the IFNM until the new RMP is completed and approved (USDI, BLM 2001a). The BLM Tucson Field office released the Proposed Final Resource Management Plan (PFRMP) and Record of Decision for the Ironwood Forest National Monument on February 25, 2013. This extensive process spanned nearly 7 years and the Friends of Ironwood Forest have been very involved in offering input and participating in the development of the plan. The management plan closed all lands within the IFNM to recreational target shooting. We are working with the BLM to assist, in whatever way we can, with enforcement, implementation, and clean up of damaged sites on the Monument. The management plan directs the BLM to develop a subsequent Travel Management Plan for the Monument. This plan should be completed within the next year. It will detail road uses, locations, maintenance levels, user expectations, and closures. If you would like to be kept informed of the TMP planning process please contact Friends of Ironwood Forest at [email protected]. Saguaro with severe damage from illegal shooting on the Ironwood Forest National Monument. Friends of Ironwood Forest have completed many restoration projects on the Monument. Below are some examples of the work we have done and are doing. Allyson Kumataka was one of the volunteers who helped early on with the Waterman Mountains buffelgrass effort. She passed away while hiking high on the slopes of Mt. Whitney on 30 July 2010. Not only did Allyson pull buffelgrass and contribute to restoration projects on the Monument, she also served on the Board of Directors for the Friends of Ironwood Forest. The Waterman restoration site is named in her honor – The Allyson Kumataka Memorial Restoration Site, previously known as the “Harlow Jones Site”. After Mr. Harlow Jones was declared a trespasser in the mid-90s on federal land and forced to level out the land that he had disturbed, the 18-acre patch of disturbed land became a waist-high monoculture of buffelgrass. In 2005, AZ Sierra Club held “Buffelgrass Pull” events once a year, but the buffelgrass came back aggressively each year. BLM paid contractors to spray the site in the summers of 2008 and 2009. The spraying helped, but did little to abate of buffelgrass re-growth and germination. In June 2010, using heavy equipment BLM made a thorough landscape reshaping of the entire disturbed landscape, carefully shaping terraces along contours while leaving abundant surface litter and rocks to promote rainwater absorption. July 2010 marked the beginning of this restoration project under the leadership of the Tucson Chapter of the Arizona Native Plant Society and the active support of BLM. The Arizona Native Plant Society has teamed up with volunteers from many groups, including the Dove Mountain Hiking Club, Boy Scouts of America, the University of Arizona, and Friends of Ironwood Forest for this project.